So a few days ago I think, my SO and myself found ourselves walking around MidValley Megamall. It's been awhile since we've been there. A lot has changed, especially the top floor where GSC Cinemas is located. They've done a brilliant job of renovating and refreshing the look of this level. It's a lot nicer than it was before. Classier in fact and a lot more comfortable to walk around. Anyway, wandering around looking for something to nosh on, it was approaching dinner, we decided to try Yoshinoya. Well, not try exactly. I've had Yoshinoya before. The first Yoshinoya that I remember opening in Malaysia was in KLCC or more specifically Suria KLCC the mall attached to KL landmark twin towers. Back then it was located at the food court and was as you'd expect being located at a food court not a really fancy affair. You walked up to the cashier picked what you wanted from the menu, paid and waited for it to be put on a tray in front of you and of you go to find a place to sit. But this new Yoshinoya at MidValley is a different beast altogether. But before we get to that a little background on Yoshinoya. It was opened way back in 1899 by Eikichi Matsuda at the Nihonbachi Fish Market in Tokyo. In 1926, after the Great Kanto Earthquake it moved to the famous Tsukiji Market also in Tokyo and the in 1952 it opened its first 24 hour store. In fact it got into a price war with McDonalds in early 2000's when they introduced a product that cost less than what you could get at McDonalds. It's a really fascinating story which you can read here at the Yoshinoya USA site and here at the Wikipedia page for it. Moving on, the Yoshinoya that now locates itself in the centrecourt area at the top most floor of MidValley is no longer just a small section in a food court. Although the way you order your food is the same. You walk up to the cashier, make your choice, get it and find a seat. Here's where it's different. It's store all on it's own but it shares it with a drinks and dessert section and another section that serves Udon. It's all under Yoshinoya. 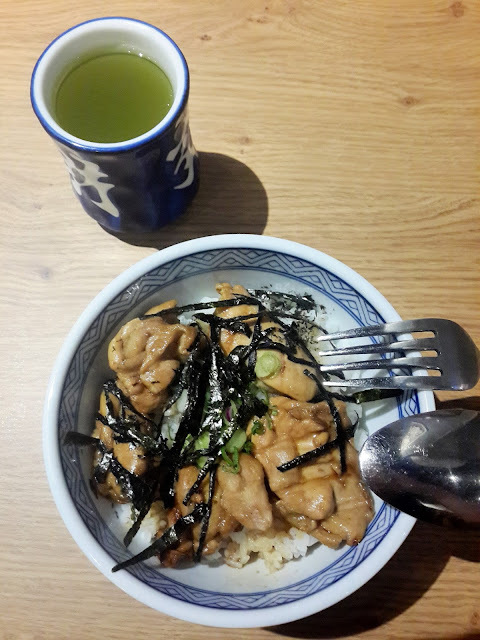 Previously you only had whatever Yoshinoya had to offer which was simple and uncomplicated. Not to say that it's complicated now, the menu is still limited and simple so you won't have that much of a headache trying to decide. The decor is simple and nice, very much what you'd expect from a Japanese restaurant. Lots of wood everywhere and the seating is compact. When we went it was pretty much full house but I guess because it is a simple and very filling affair, people just sit have their fill and move on. So we didn't have to wait long for a seat. Which was sort of nice. Although I have to say it's easier to probably find seats for a small party then a huge one. Sorry but don't have pictures of the store. That up there as you can see is the Kitsune Udon. A simple fair. Simple broth and a few pieces of sweet tofu skin. Actually not my first meal but a second one. I was starving. It filled me up pretty good. A good choice I think for someone looking for a simple oil free and very filling meal. Or if you're starving like I was, something to fill the gaps. That up there I picked up while I was getting my Udon. It looked interesting. 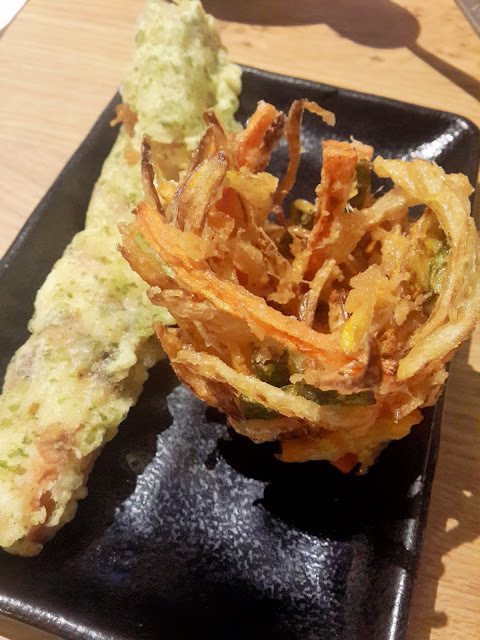 The pale long one on the left is just a japanese fish sausage covered in tempura batter that also has seaweed in it. Sweet and savory. 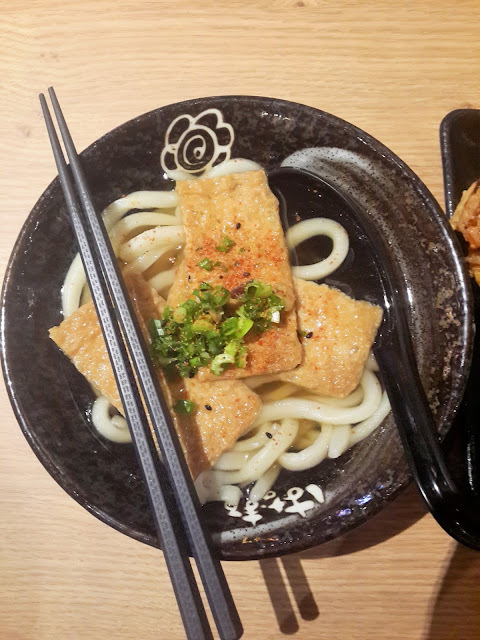 Good complement to the Udon. The one on the right is a combination of slices of sweet potato, onions, long bean and some other stuff deep fried. Tasty but a tad too oily. That one is just the regular order of the Yakitori bowl which my SO had. Simple marinated chicken pieces grilled and laid out on a portion of rice with a little seaweed. Simple nice and perfect for those on a diet (I think). I don't do diets. This one's mine. 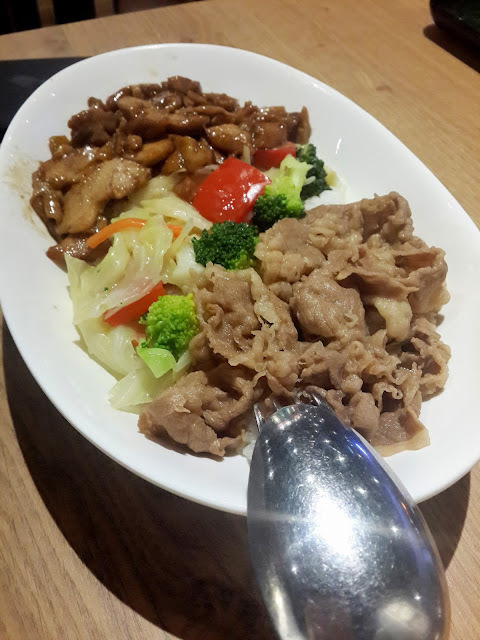 A combination of the beef topping that Yoshinoya is famous for and the yakitori chicken and simply cooked vegetables. A pretty big portion about twice the size of that yakitori bowl you see up there. Tasty. But still wasn't enough to satisfy me. Anyway, both the rice based meals come with green tea if you wish which you can have refills on till your bladder burst. It's also available if you order the Udon. So all in all you can have a pretty tasty and filling meal for around RM10 or a little under USD3 if you're reading this and you're not from Malaysia. Also having a meal not from a local purveyor for this price in Malaysia is actually a rare thing these days. So there you are. My first food related blog. Hope you enjoyed it. I enjoy eating. Not so much the writing about it. HAH! !